Registrations for Winter 2019 (Terms 2 and 3) are closed. However we still have a limited number of open spaces in various teams fro U8 to U20 - please get in touch with us to find out. Registration fees for the 2019 Winter season will be $240 per player. The "age" of players for determining which age group your child plays in summer season is the child's age at 31st December 2019. This is the same rule that has been in place at the CBA since summer season 2017/18. Registrations close Sunday 9th April. Players that register before the cutoff will be given priority in team allocation. If you are new to the online registration system, please read on. As of Winter 2017 season, all registration will be through an online system called SportsTG. The system allows us to manage our registrations online, accept credit card payments, and provides online access for things such as ladders and fixtures. There is an app for iPhone and Android that lets you view this information on your phone. Registration for the 2019 Winter season will be $240. This includes cost of training venue, weekly team sheet costs, team registration fees, and uniform hire. A $50 refundable uniform bond is payable once per family, and will be refunded when all uniforms are returned in good condition once children cease playing with the club. The only other week-to-week fee is the venue entry fee on Saturday, currently $3 per person. We are also pleased to announce that we will continue to work closely with the Coburg Giants to bring you clinics for players and coaches, as well as guest coaches to your kids' training sessions. This is a great opportunity for kids and coaches to improve their skills. ​Our club offers a multi-child discount for families - third and subsequent children will receive a 10% discount on their registration fees. Note that you can still be billed and pay via EFT if you wish - credit card payments are merely another option. We won't be charging the uniform bond over credit card, as this process is still manual. The registration form should be fairly intuitive, however instructions on how to register are below should you need them. If you do not already have an account with SportsTG, you will prompted to create one during the registration process. It is recommended that the email address you use to register is your own personal email address - work email addresses often cause issues due to overly-aggressive spam filters, holidays, and changing jobs. A confirmation email will be sent to that email address. 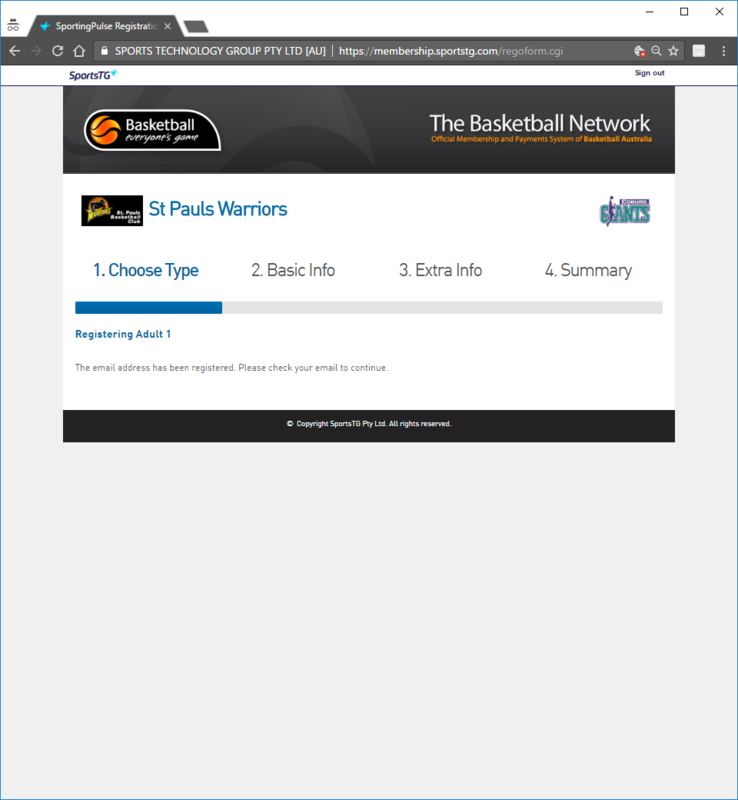 The steps shown below assume you are new to SportsTG, and will also take you through the process of creating an account. 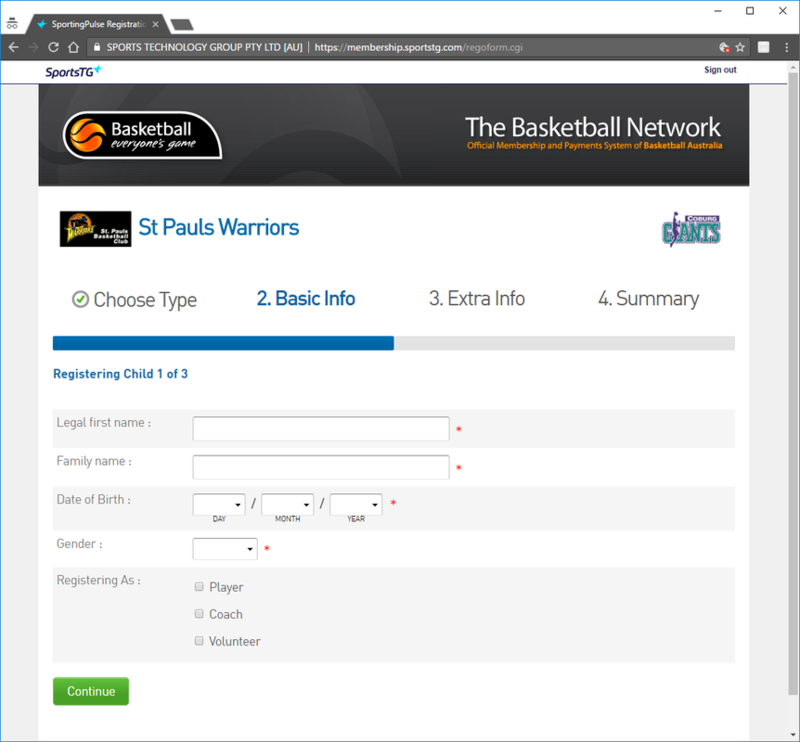 If your child is already playing with the Warriors, their details should already be in SportsTG, and the registration form should be pre-filled in the registration form. 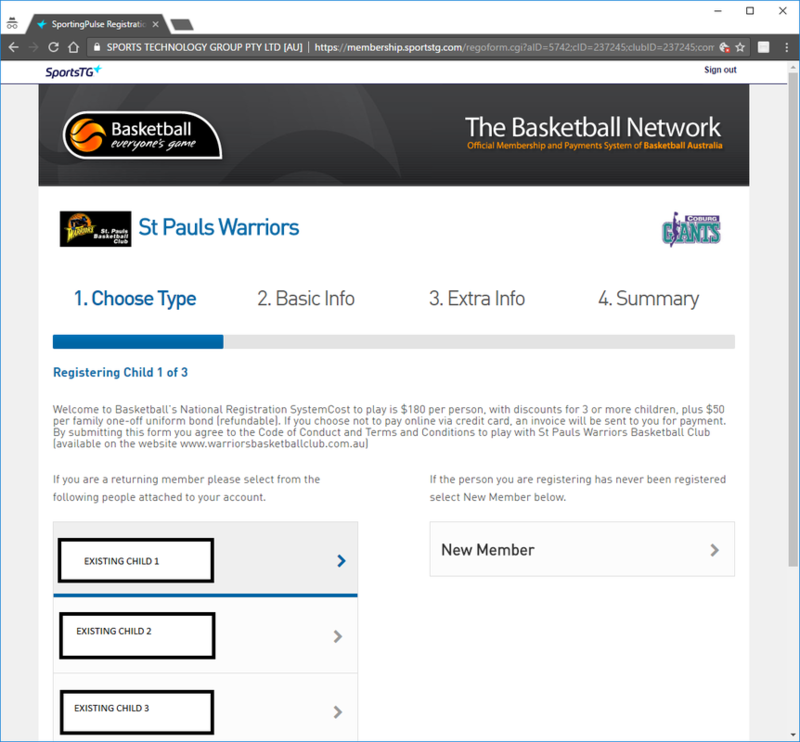 If you are new to the Warriors, the information below should guide you on how to register. The image below shows the first page of the registration form, where you choose how many adults and children you wish to register. To save re-entering information (eg. parental contact information) you can register multiple children in one step. Adult players (over 18 years of age as of the date of registration), coaches and volunteers (eg. team managers) should also register. 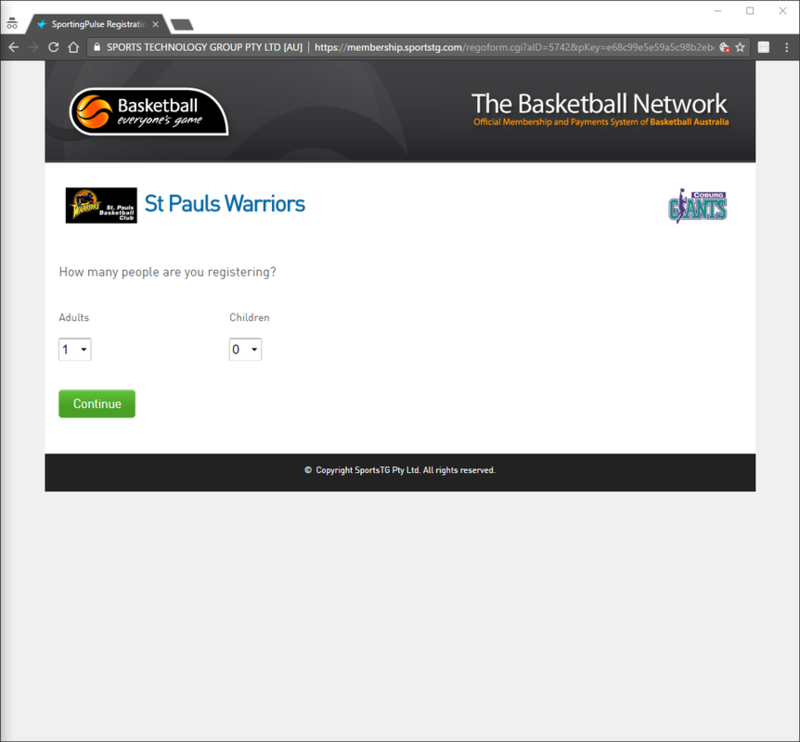 A later screen lets you choose if you are registering to play, coach or volunteer. 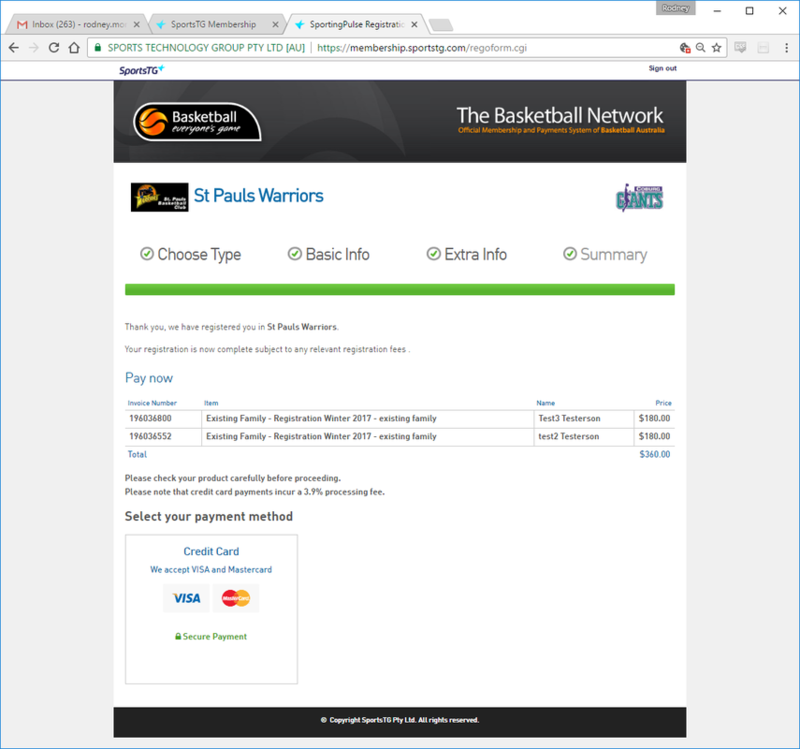 The second screen is where you log in to your SportsTG account, using the email address you registered with. 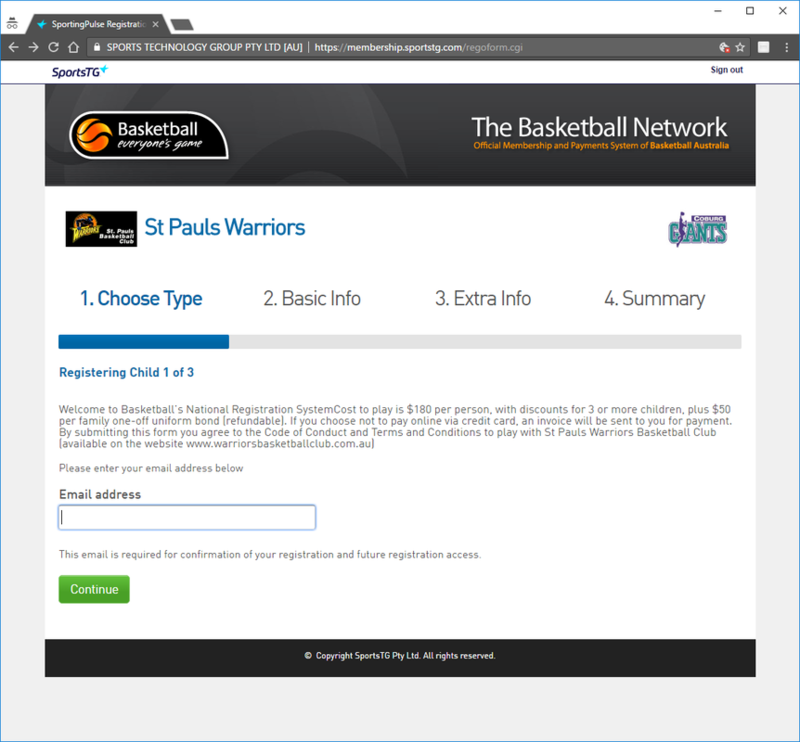 If you don't already have a SportsTG account, enter your email address here and you will be prompted to create an account. If your account is new, you will see the following screen - click the "Yes, I'm new" button to continue. You should now see the below screen. You should shortly receive an email from SportsTG. That email will contain a link called "Click to set password". Click the link. When you click the link in your email, you will be taken to the following screen. 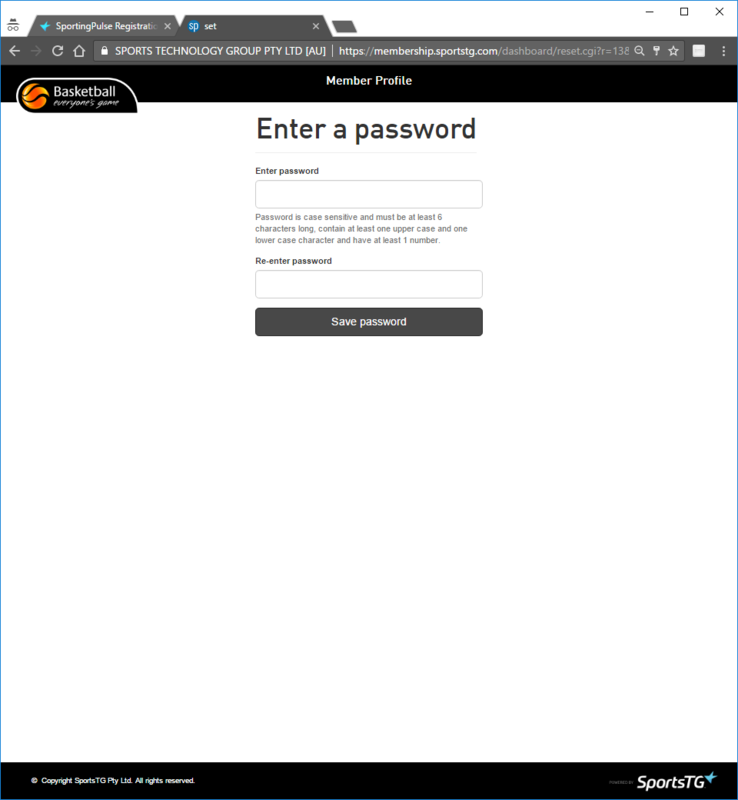 Enter your password twice, then click "Save Password". 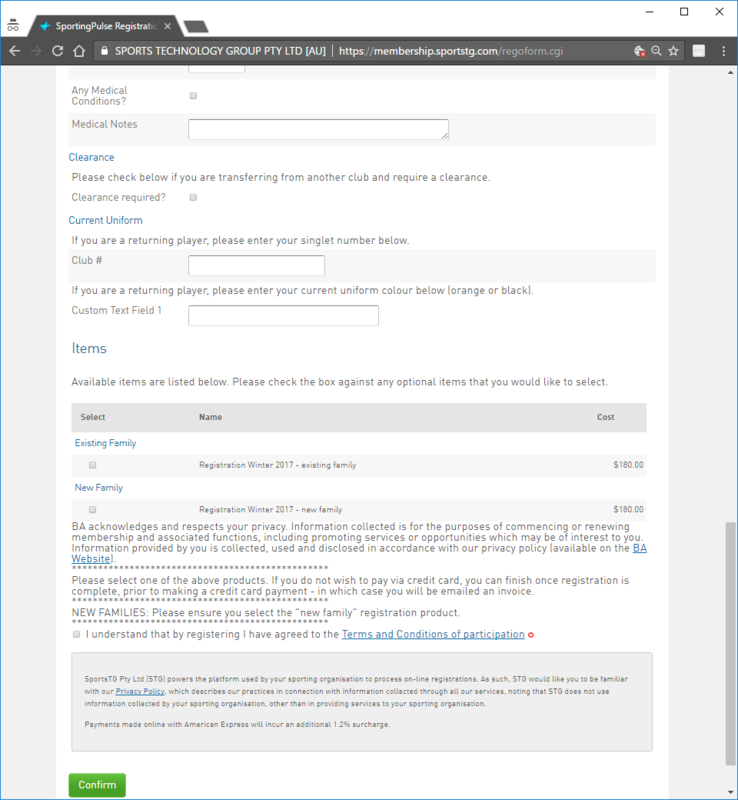 Your SportsTG account is now set up, and you can continue with the registration, by clicking the "Click here to continue" link you will see. Now that you have an account, you will be taken to the following screen, where you will select who you wish to register. 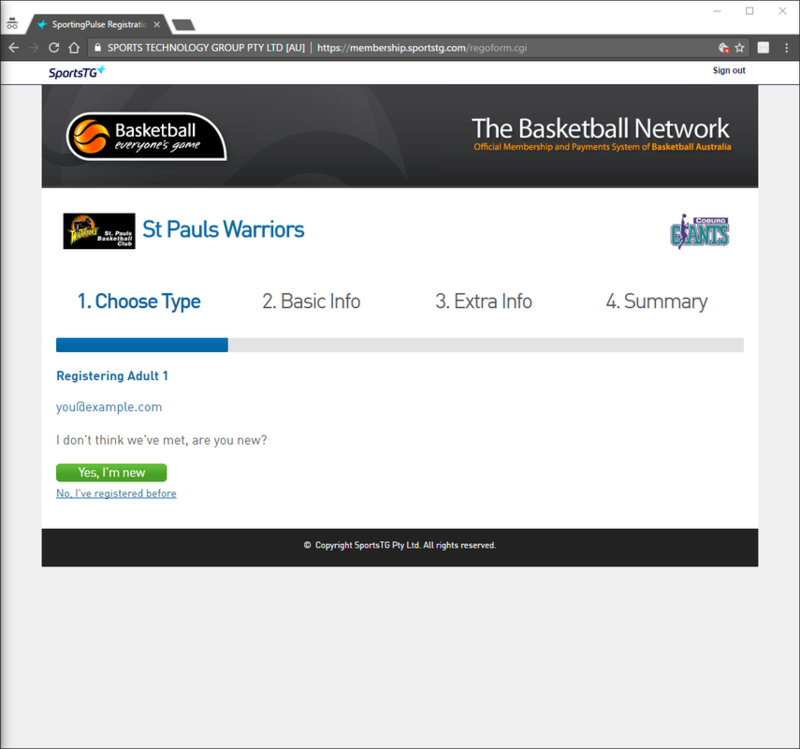 If you are new to SportsTG, you will have no members in your account (existing members are shown on the left), so click "New Member" to create a new person - be it player, coach, or volunteer. As shown in the below screenshot, here you enter the basic information for the first member you are creating. Each registration can be for player, coach or volunteer (eg. team manager), and you can choose multiple. After filling in the basic information, you are presented with a form with detailed information. This section includes parent/guardian information (for child registration), emergency contact details, medical information etc. - Medical conditions: if this registrant has any medical issues, please check this box and fill in the details in the space provided. - Clearance: if this registrant is currently registered with another club at the CBA, please tick this box. 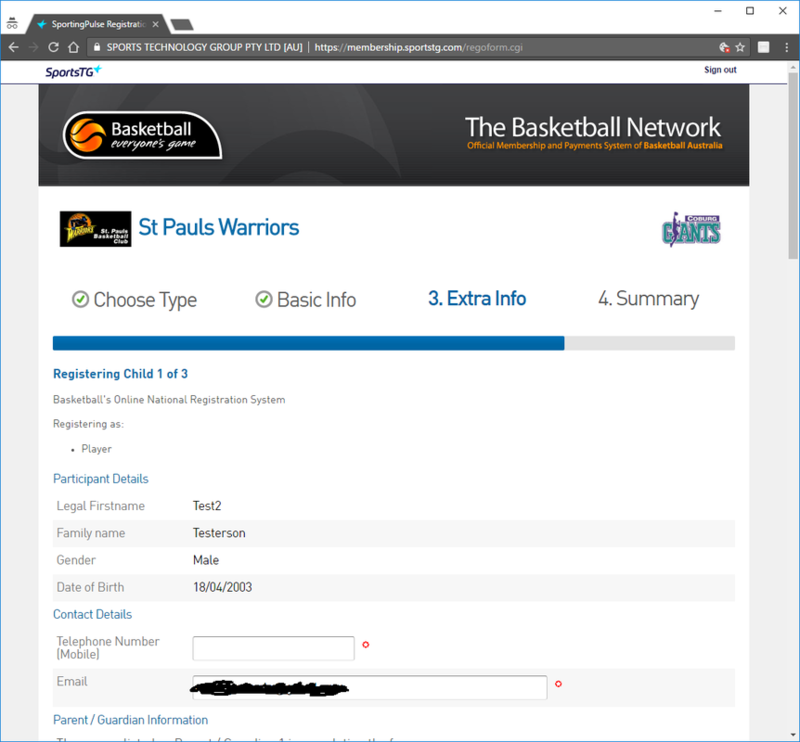 - Current uniform: ifyou are registering an existing Warriors player, please also include their uniform details - singlet number and colour (black or orange). ​Please ensure you select the product that applies (for player registration). If you are registering only as a volunteer or coach, you don't need to select any product. If you are registering as a coach or volunteer, you will see a section where you will need to enter your Working With Children Check information (a.k.a. "Police Check"). If you are registering an adult coach or volunteer, please enter Working With Children information in the fields provided. Note that WWC is mandatory for all adult coaches and team managers. A WWC for volunteer organisations is free - visit www.workingwithchildren.vic.gov.au/ to apply. Read and agree to the terms and conditions, and then click "Confirm" to be taken to the credit card payment page. If you selected multiple registrations in Step 1, you will be taken back to Step 6 to enter details for the 2nd and subsequent registrations. As you proceed you should notice that some of the fields will have been pre-populated for you, and others will be missing as they are assumed to be the same for a single family. At this point, your registration is complete, although your registrations are non-financial. Should you wish to pay via credit card immediately (note there is a 4% credit card processing surcharge), click on the "Credit Card" option under the "Select your payment method" heading, to be taken to the credit card payment screen. Should you not wish to pay via credit card, and instead be emailed bank transfer details by our treasurer, you can simply close the window at this point. Our club treasurer will get in contact with you soon, to arrange payment. Please note that non-financial players may not be permitted to take the court until outstanding fees are paid. You should now get an email confirmation for each registration you have submitted. Volunteers from the club will be in touch shortly with information regarding training venues, uniforms etc. If you would like to help out, please register yourself - if you'd like to help team manage, please register as an "Official". If if you would like to coach, please register as "Coach".